Cleans and preserves all Color and B & W films. 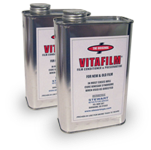 Adds life to old film, removes brittleness and dryness. 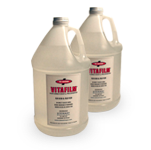 Lubricates, and in most cases, will CURE vinegar syndrome, when used as directed. 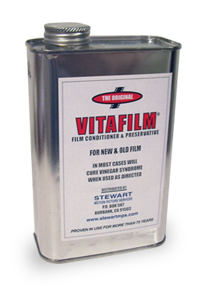 Superior to any film conditioning product you've ever used. Proven in use for more than 75 years. Plus shipping and handling determined at checkout. 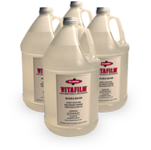 Vitafilm is ONLY available in the Continental United States. Sorry, no shipments to Hawaii or Alaska. 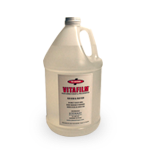 As a just retired 35mm projectionist who started in a 16mm lab in Philadelphia in the 60's, THANK YOU for bring Vitafilm back! 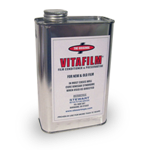 I was first shown the virtues of Vitafilm in 1969 and have used it ever since. 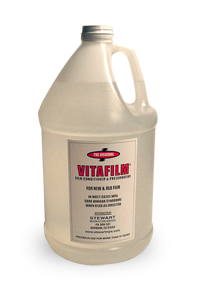 In the 90's, I had a one gallon can that I used sparingly for many years because I thought I would never have it again. Works really great with older IB Tech.